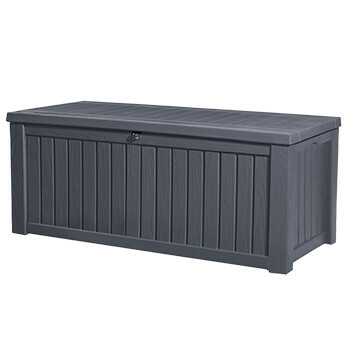 Securely store away garden items and accessories with the Keter Rockwood Storage Box. It is a fantastic solution to keeping the garden tidy, and has a stylish woodgrain finish. With a capacity of 570 ltr, this storage box is one of the largest in the Keter range, and has the option of a lockable lid. It is strong and durable in its design, and can also be used as a bench, making it a great multipurpose addition to any garden. The Keter Rockwood Storage Box is a multipurpose garden product. 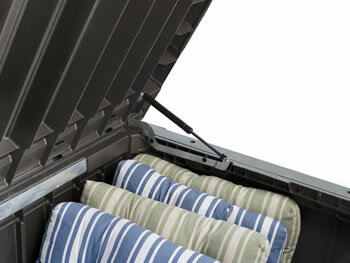 It functions primarily as a waterproof storage box, but can also be comfortably used as additional garden seating. With a capacity of 570 ltr, it is one of the largest lockable storage boxes from the Keter collection, and is suitable for gardening tools, barbecue equipment, cushions and pool/ hot tub accessories. It is also great for storing animal and bird feed, owing to its watertight, yet ventilated design. This storage box is easy to assemble and has been built to last. Its resin outer means it will never rust or rot. It features a hydraulic lid which allows easy opening and soft closing, and has a natural looking wood grain finish which will fit in with the aesthetic of almost all gardens. The box can also be locked simply with the use of a padlock (not included).